When it comes to polishing stainless steel, we do it best. Whether it’s your material, or material we source for you, we provide any and all finishes on stainless steel and stainless steel duplex alloys, stainless steel clad, Inconel and Hasteloy, to name just a few. Whatever your finish needs, trust us to exceed your expectations. 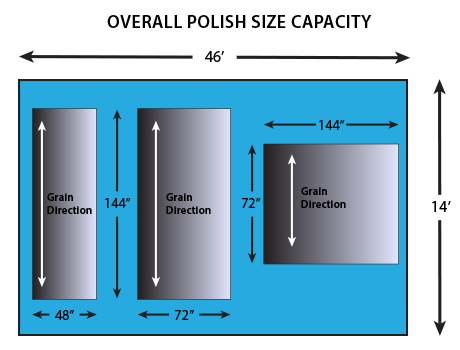 We can provide any required finishes up to and including a 3 Ra maximum #7 PLUS “near-mirror” or “pre-buff” in any thickness flat rolled material from 14 Gauge to 10″. We can provide ANY specific Ra or grit finish – as fine as a 3 Ra Max. near-mirror. We GUARANTEE not to exceed the maximum Ra required in any spot. #6 20 Ra Max., Offering “2B” mill finish surface roughness in a fine grain satin appearance. Chosen for minimized surface friction in powder and silo applications among others. Used where a better, tighter finish than standard #4 is desired. #7 9 Ra Max., Very fine highly reflective satin grain. Often used when the finish will be further refined through buffing. Earthquake attenuation slide plate surfaces as well. #7 Plus 3 Ra Max., Near-mirror highly reflective ultra fine grain satin. Often used where mirror finishes are called for and considered much more cost effective as a mirrored plate alternative. All polished finishes include 100% of the HRAP surface “scale” removed to clean “parent” metal but not 100% Pit-free unless specifically requested. All finishes quoted as Maximum Ra taken in any spot. Never averaged. 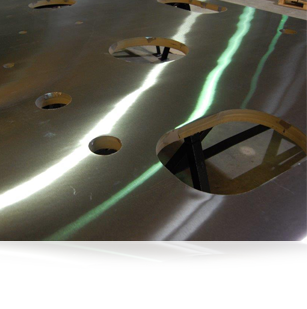 Many customers like the idea of delivering a plate “kit” to the fabricator: for example, for materials, cut, drilled, and polished. Your customer receives ready-to-build materials. Polished and ready for fit-up! We sequence, polish, pack and ship direct for you. Maximize material yield and nest your parts into larger plates or sheets. We’ll apply the exact finish and protect for laser or water jet cutting after polishing. Great economics are the result. Large irregular shapes made polishable and any cutting method acceptable.